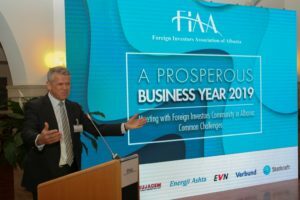 Early this year, FIAA hold its yearly ceremony the “Wishes for a Prosperous Business Year ahead”! This event brought together a large part of the Foreign Business Community in Albania, representatives of the diplomatic bodies along with several representatives of the state institutions in the country. During the Event were introduced as Guests of Honor the newly appointed Ministers respectively, Ms. Belinda Balluku in the quality of Minister for Infrastructure and Energy and Mr. Eduart Shalsi as Minister of State for the Protection of Entrepreneurship in Albania. The FIAA’s President, Mr. Tom Larsen expressed some remarks and his gratitude to the members who have trusted FIAA throughout its existence and have stayed together for more than 18 years. Among others he stressed: “It is in our mission to cooperate with the government and other relevant institutions for a better investment climate to attract more foreign investors to Albania. During last year we have had specific initiatives on anti-corruption and business ethics, we arranged the first of its kind summit promoting tourism in Albania, and we partnered for the Tirana Economic Forum where, interesting Economic discussions took place”. Mr. Larsen shared his recent experience from the meetings he had with the new ministers in the government, where he has observed a positive attitude and will to meet, listen to the Investors’ concerns and expressed to take action to resolve issues where coordination is needed. He said that he hopes these changes will represent new opportunities and they will ride the wave to bring the country forward. The President of FIAA also emphasized that the recommendations of the White Book introduced last year, are still valid, that, there is need for more work on several laws, including mining Law, hydrocarbon law and licensing regulations, the progress for the albanian power exchange, along with several renewable energy law amendments. For this, we would proudly share the Document with the Ministers here, said Mr. Larsen. The New Ministers had the chance to extend their wishes to the present Investors and expressed their willingness to strengthen the communication with the foreign business community and be active to listen to their issues and cooperate to find solutions.